We have provided workshops to inclusive yet focused groups of people including parents, teachers, interpreters, and university students. Topics we have covered thus far at both the introductory and intermediate level include: Cued Speech, general teaching methods, language enrichment strategies, play-based learning techniques, and experiential learning/teaching methods. From the outset, it has always been important to our initiative that we respect and honor the culture of those who seek our services. Almost all of the individuals who come to the Deafness Center are deaf or hard-of-hearing persons, and many come to investigate the possibility of amplification support. After conducting a few initial testing and counseling sessions, Dr. Catherine Clark has provided hearing aid devices and training to nearly 70 individuals. As part of the agreement with these individuals, they must check in with the Deafness Center at least once per month in order to retain use of their device(s), which has enabled the Center to better support these individuals and assist them in managing device maintenance & care issues. Over the past several years, volunteer audiologist Dr. Catherine Clark (of the National Technical Institute for the Deaf at RIT) has personally tested and provided counseling to over 180 individuals. As there are widespread misconceptions about deafness, this service allows individuals with hearing loss and their families to ask questions, express concerns, and better understanding their own hearing loss and what it means for them. Two staff (one Deaf and one hearing) have also been trained by Dr. Clark, and are now conducting regular, year-round hearing testing & counseling, having provided testing and support to dozens of new individuals since being trained last year. 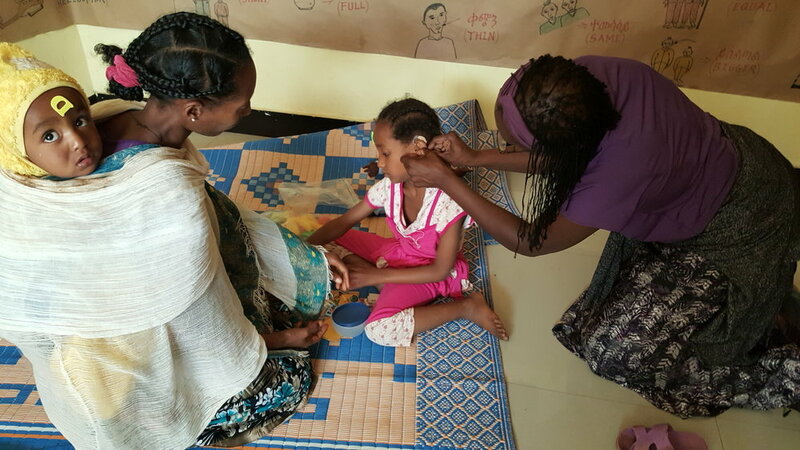 Working in close collaboration with the 2 local ENTs from Felege Hiwot Hospital, free ear check-ups are conducted at the Deafness Center by these physicians once or twice per month. When appropriate, assistance for obtaining medication (i.e. : ear drops) or other supplies is given to those in need and/or those facing chronic ear infections. Hundreds of individuals have accessed this service to-date. The most recent development in our work has been to lay the foundation for services that encompass a variety of target areas including articulation/speech production, language development (signed or spoken), and listening habilitation/rehabilitation. Our long-term goal is to provide sustainable services to individuals in the community by mentoring local professionals to become service providers themselves. Of the 22 individuals who received amplification devices in August 2017, all 22 showed improvement and would benefit from additional listening practice with trained staff members. Two local staff were trained in listening practice techniques and post-amplification counseling, and were supervised in practical experiences by trained SLPs from the U.S. to perform the tasks appropriately. Building off the advances we have made in providing audiological, ear health, and educational services to our target population (of which there are many, many more on the waiting list! ), we have only just begun to lay the foundation for providing the type of necessary, robust, year-round listening and speech-language support services that we envision having on offer at the Center. We hope you will consider making a financial contribution today to help realize this dream and provide a higher quality of education & care to so many in need. Here is a breakdown of what we require to keep this project moving forward! 2. To make a one-time or recurring donation online: Simply use the button below! All donations are tax-deductible to the fullest extent of the law. We provide tax receipts in a timely manner for all donations received. For your reference, our federal tax ID# is 26-3386678. And thanks to a special nonprofit rate, PayPal levies only a 2.2% transaction fee off your total amount.